Lungs, in man, as well as in quadrupeds, birds, and reptiles, the principal organs of respiration. 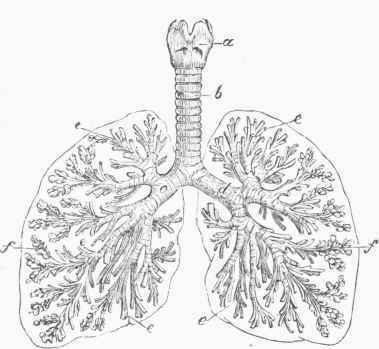 The lungs always consist of membranous sacs, contained in the interior of the body, into which the atmospheric air is introduced through the air passages, and the walls of which are abundantly supplied with capillary blood vessels. The blood, thus brought into close relation with the atmospheric air, being separated from it only by the extremely delicate and transpirable pulmonary membrane, absorbs oxygen in its passage through the lungs, and exhales at the same time watery vapor, carbonic acid, and various animal excrementitious substances. The lungs therefore constitute an organ in which the blood is purified from its deleterious ingredients, and is also supplied with a gaseous element essential to the continuance of life. This is the object of the function of respiration. - In many of the naked reptiles, or batrachians, the lungs consist of simple, straight, tubular sacs, communicating with the pharynx by a common orifice, and terminating posteriorly by rounded extremities. Their internal surface is smooth, and the air, forced into them by a kind of deglutition, suffices for the imperfect respiration performed by these animals. In others, as in the frogs, and still further in turtles and sau-rians, the lungs are more important and more complicated in structure. They are still air sacs; but their cavities are divided into a considerable number of secondary spaces or areola), by incomplete partitions, of a thin membranous texture, projecting from their internal surface. This increases very much the extent of the respiratory membrane; and as the blood vessels penetrate everywhere the substance of the partitions, as well as the rest of the pulmonary walls, the mutual action of the air in the sacs and the blood in the vessels is greatly intensified, and the same result is accomplished in a comparatively short period. Thus pulmonary respiration in these animals is more active in proportion to the increased involution of the pulmonary membrane. This complication of the structure of the lungs is carried to the greatest extent in the warm-blooded animals and in the human species. In man the respiratory apparatus commences at the larynx, which communicates by the opening of the glottis with the pharynx. The larynx is continuous below with the trachea, a cylindrical tube, four inches in length and nearly one inch in width, running down the anterior part of the neck, on the median line, to the top of the chest. 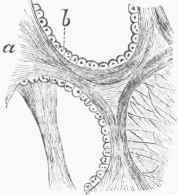 It is composed of a fibrous membrane, strengthened by a series of cartilaginous rings, complete in front but open posteriorly, which serve to maintain the cylindrical form of the trachea, and to keep its cavity open for the free passage of the air. It is lined with a mucous membrane covered with ciliated epithelium. At the upper part of the chest the trachea divides into two main branches, of a structure similar to its own, the right and left bronchi, each of which passes to the root of its corresponding lung. Here the bronchi begin to divide, subdivide, and ramify, radiating in smaller and more numerous divisions to every part of the lungs, and becoming constantly more delicate and membranous in their texture. They are now called the bronchial tubes; and their smaller ramifications lose altogether their cartilaginous element, and consist only of a fibro-elastic tubular membrane. Each terminal bronchial tube finally goes to a special division of the pulmonary tissue, termed a lobule. This is an ansae of a more or less conical form, the bronchial tube opening into it at its apex, while its base is turned in the opposite direction. The interior of the lobule, like the entire lung of the frog, is imperfectly divided by membranous partitions into secondary cavities of a cuplike form, all of which, though separated from each other, communicate with the central cavity of the lobule. These terminal cavities, into which the air finally penetrates, are called the air vesicles. The air vesicles are rounded cavities, about 1/75 of an inch in diameter, lined with a single layer of pavement epithelium. They are surrounded by a tissue containing a large proportion of elastic fibres, in which also ramify the capillary blood vessels. Owing to the small size and excessive multiplication of these air vesicles, the entire extent of respiratory membrane in the human lung is very great. It has been estimated by Lieberkuhn at not less than 1,400 sq. ft.; and there is reason to believe that this estimate is not an exaggeration. - The tissue of the lungs is thus of a spongy nature; that is, it contains a multitude of minute cavities, filled with air, disseminated through a soft, moist, fibrous, and vascular texture. Accordingly, unlike any of the other internal organs, the lungs are lighter than water, and float upon its surface when separated from the body. They also retain the air entangled in their substance with such obstinacy that it cannot be expelled by any compression or violence short of absolutely disintegrating the pulmonary substance; and the lungs, if healthy, will still float upon the surface of water even after they have been bruised and mutilated to an excessive degree. This has given rise to the "hydrostatic test" for determining whether a newly born infant, found dead, has been born alive. The lung which has never breathed sinks in water like any other solid organ; but if respiration has been once completely established, the lung floats, and cannot be made to sink by any ordinary method of manipulation. The application of this test, however, requires several precautions in particular cases, which are usually fully discussed in works on medical jurisprudence. - The lungs, as a whole, are conical in shape, their apices situated at the top of the chest and projecting slightly into the root of the neck, and their base, which is concave inform, resting upon the upper surface of the diaphragm. They are of a pinkish gray color, and are variegated with spots and streaks of a dark ashen or blackish hue. They are quite elastic in consistency, owing to the abundant elastic fibres which they contain; and accordingly, when taken out of the chest, or even when the chest is widely opened, they spontaneously expel a portion of the air-which they contained during life. Enough, however, still remains to give them the characteristic buoyancy by which they are distinguished. Each lung is covered, over the greater part of its surface, by a thin, smooth, moist, and polished serous membrane, the pleura, which, reflected outward at the root of the lung, also lines the internal surface of the thoracic cavity. These two free surfaces of the pleura being in contact with each other, or separated only by an extremely thin layer of serous fluid, the lungs and the walls of the chest slide gently over each other in the movements of respiration, without friction or injury. - The lungs are supplied with blood from two sources. First, the pulmonary artery brings the venous blood from the right ventricle of the heart and distributes it to the pulmonary capillaries, when it is returned to the left auricle by the pulmonary veins. This blood, which is in great quantity as compared with the amount of solid substance in the pulmonary tissue, is brought to the lungs, not for the nutrition of these organs, but for its own aeration. Secondly, the bronchial arteries, a number of small vessels which come off from the thoracic aorta, and follow the ramifications of the bronchi and bronchial tubes, supply these tissues with arterial blood for the purpose of their own nutrition. It is returned to the right side of the heart by the bronchial veins. The nerves of the lungs consist of the pulmonary branches of the pneumo-gastric nerve, and the pulmonary plexuses of the sympathetic. They are also provided with an abundant supply of lymphatic vessels; and the lymphatic glands belonging to them, known as the " bronchial glands," often become very conspicuous at the root of the lungs, from the deposit in adult life of a dark pigmentary matter in their substance. - The lungs are liable to a variety of acute and chronic diseases, the most important of which are pneumonia, or inflammation of the lungs, and pulmonary phthisis, or a wasting of the lungs owing to a tuberculous deposit in their substance. 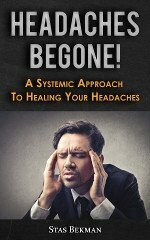 (See Bronchitis, Consumption, and Pneumonia.) They are also liable to be compressed by serous effusions into the cavity of the pleura, to be wounded by the extremity of a fractured rib, or to be the seat of haemoptysis or of pulmonary apoplexy. Arrangement of Air Passages in the Human Lungs. - a. Larynx, b. Trachea, c, d. Bronchi, e. Bronchial tubes. f. Lobules. Two of the Lobules of the Human Lung. - a. 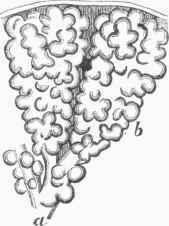 Small bronchial tube, a terminal branch of which goes to each lobule, b. Bounded air vesicles, projecting from the surface of the lobule. Air Vesicles of the Human Lung, partially cut across, and highly magnified. - a. Fibrous tissue intervening between the vesicles, b. Layer of epithelium cells, lining the internal surface of a vesicle.